The Texas Rangers are only sending one player to the 2017 MLB All-Star Game. 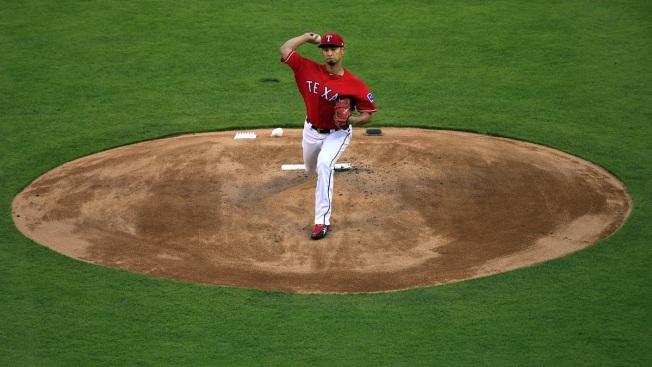 Yu Darvish was among the eight pitchers — and eight reserve position players — to be voted to the team by other players. Starting position players were voted on by fans. Five more players — including Rangers shortstop Elvis Andrus — are on the bubble for the AL's roster. Fans can vote on the final spot until 3 p.m. Thursday. The fans apparently wanted to see some new blood, as the dozen first-time starters are the most since voting was returned to fans in 1970. Aaron Judge, Carlos Correa and Nolan Arenado are among those first-time starters for the July 11 game at Marlins Park. "I've got to call my family and tell them to book a flight to Miami. They're going to be excited," Judge said after rosters were announced Sunday. Just one player was picked from the World Series champion Cubs: reliever Wade Davis, who wasn't even with Chicago when it ended a 108-year title drought last fall. The Cubs had seven All-Stars last season, including their entire starting infield. "Frankly, we haven't had many guys who were all that deserving," Cubs pitcher Jake Arrieta. Just past the halfway point, the Cubs are 41-41. "Maybe this is actually a good thing. Right now, rest is not a bad word," said Chicago's Joe Maddon, who will manage the NL. In a sign of the generational change, the All-Stars with the most selections are Los Angeles Dodgers pitcher Clayton Kershaw with eight and St. Louis catcher Yadier Molina with seven. Detroit's Miguel Cabrera, the senior All-Star last year with 11 selections, wasn't picked for the first time since 2009. Two of the first-time starters are from the Houston Astros, who have the best record in the major leagues: Correa, the shortstop drafted first overall in 2012, and outfielder George Springer. Second baseman Jose Altuve was elected to his third start. "It's something that you dream about since you are a little kid, since you get drafted, since you sign a professional contract," Correa said. Nationals outfielder Bryce Harper, second baseman Daniel Murphy and first baseman Ryan Zimmerman were elected to start, and Max Scherzer and Stephen Strasburg were selected for the pitching staff. Harper led fan voting with 4.63 million ballots. "Definitely humbled by fans, the way they treat me," Harper said. At 32, Zimmerman is an All-Star for the first time since 2009, when he was a reserve third baseman. "Yeah, sports are funny, man," Zimmerman said. "It's just a crazy path to get back, but it's also pretty cool." Judge, the 6-foot-7 rookie who leads the major leagues with 27 home runs, topped the AL with 4.49 million votes. He is joined in the outfield by Springer and Los Angeles Angels star Mike Trout, who hopes to return in time from a torn thumb ligament. Cleveland's Jose Ramirez overtook Minnesota's Miguel Sano in the final days of balloting to win the AL third base spot by about 54,000 votes, Toronto's Justin Smoak bounced back to beat Kansas City's Eric Hosmer by 555,000 at first base, and Tampa Bay's Corey Dickerson rallied to win at designated hitter by nearly 75,000 over Seattle's Nelson Cruz. The Royals' Salvador Perez won at catcher. "It would be even more fun if there were a few more guys going from the team," said Posey, whose Giants are last in the NL West. "I'm just happy for Cleveland," said the Indians' Terry Francona, who will manage the AL. "I think the fans and the city — everybody should be proud." Marlins outfielder Giancarlo Stanton was picked as a reserve and plans to defend his Home Run Derby title on July 10. Judge also has been invited, and Los Angeles Dodgers rookie Cody Bellinger, who leads the NL with 24 homers, has said he will participate. "It is going to be amazing," Stanton said. "Either way, the week was going to be cool, but this makes it even cooler." The NL-leading Dodgers will send Bellinger, Kershaw, shortstop Corey Seager and closer Kenley Jansen to Miami, but nobody from Los Angeles was elected for the starting lineup by fans. Jansen was upset with his own fanbase for letting down Seager and third baseman Justin Turner. "I'll say it loud and clear again: It's the Dodger fans' fault," Jansen said. Among other strong candidates overlooked were Carlos Carrasco, Jacob deGrom, Gio Gonzalez, Ivan Nova, Roberto Osuna, Anthony Rizzo, Travis Shaw, Andrelton Simmons, Justin Upton and Alex Wood. Rosters were cut from 34 per league to 32 under the new labor deal, and online voting determines the last spot on each roster. Elvis Andrus, Xander Bogaerts, Didi Gregorius, Logan Morrison and Mike Moustakas are the AL candidates, and Justin Bour, Bryant, Anthony Rendon, Mark Reynolds and Turner are on the NL ballot. AP Baseball Writer Mike Fitzpatrick, AP Sports Writers David Ginsburg, John Marshall and Noah Trister and AP freelance writers Colin Fly, Ian Harrison, Nate Latsch, Jeremy Rakes and Dave Royse contributed to this report.